We most often associate plastic surgery with cosmetic enhancements to our outer appearance. While this is their primary purpose, some forms of reconstructive surgery restore lost function and health as well as improve appearance. A classic example is cosmetic periodontal (gum) surgery that restores receded gum tissues that have exposed more of the tooth than is visually appealing. 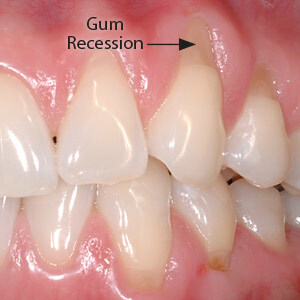 Gum recession occurs primarily because of excessive brushing (too hard or for too long) or because of periodontal (gum) disease, a bacterial infection that ultimately causes gum tissue to detach and pull away from the teeth. Gum recession not only affects the appearance of the teeth, it can expose the tooth’s root surface to further infection and decay. Without treatment, the disease could progress causing further damage with the potential for the tooth to be eventually lost. In conjunction with plaque removal to stop gum disease and possibly other treatments like orthodontics to correct misaligned teeth, cosmetic gum surgery is used to rejuvenate lost gum tissues around teeth through tissue grafting. In these procedures, a combination of surgical approaches and/or grafting materials are attached to the area of recession to stimulate the remaining tissue to grow upon the graft and eventually replace it. Donor grafts can originate from three sources: from the patient (an autograft); another person (an allograft); or another animal species, usually a cow (a xenograft). Tissues from outside the patient are thoroughly treated to remove all cellular material and bacteria to eliminate any possibility of host rejection or disease transmission. Depending on the nature of the gum recession and tooth condition, the procedure can take different forms. It could involve completely detaching the graft tissue from the host site and re-attaching it to the recipient site. But if more of the tooth root is exposed, the surgeon may cover the graft with tissue adjacent to the host site to supply blood to the graft, and affix the loosened pedicle to the graft site. While any technique requires advanced training and experience, the latter procedure involves microsurgical techniques that require the highest levels of technical skill and art. Cosmetic gum surgery can result in healthier gum tissues and teeth that are less susceptible to infection and loss. No less important, though, these procedures can return a more natural look to your teeth and gums — and a more pleasing smile.